Until 2nd February this year we were unaware that the Neonatal Intensive Care Unit at the Norfolk and Norwich University Hospital was even there – I must have walked past it seven weeks earlier when I went for my 20 week scan, however having a premature baby was not something I had ever considered would happen to us. I was having a text book healthy pregnancy; I had been really well and certainly did not see his early arrival coming! Things did not go well and by midday my husband Mike and I were in theatres surrounded by 15 NHS staff determined to make the best of this situation (all the tax we have paid over the years was worth every penny). Baby Sebastian was born weighing 2lb 4oz. I was relieved to see his arm move as he was whisked away for some serious intervention. We were relieved to see any sign of life. I first properly met Seb about 7 hours later. He was in room 1 (intensive care) on NICU. He was a mass of wires and tubes. The staff were wonderful, they explained everything that was happening and made us feel welcome at all times. We were surprised about the extent to which these babies are pushed to progress – for example it took 4 attempts of putting my milk into him and taking it out again before his digestive system developed well enough to cope. Some days things went well, sometimes he would take a step backwards – it was like an emotional roller coaster. The day after Sebastian was born we were informed that he had suffered a grade 3 and grade 4 bleed to the brain and we should prepare for the worst in terms of possible disability. This was very distressing news. Following 64 days of being part time parents with daily visits to NICU we were delighted to bring Sebastian home. His journey is on-going as we will be going to Addenbrooks soon to have a shunt fitted in his head. 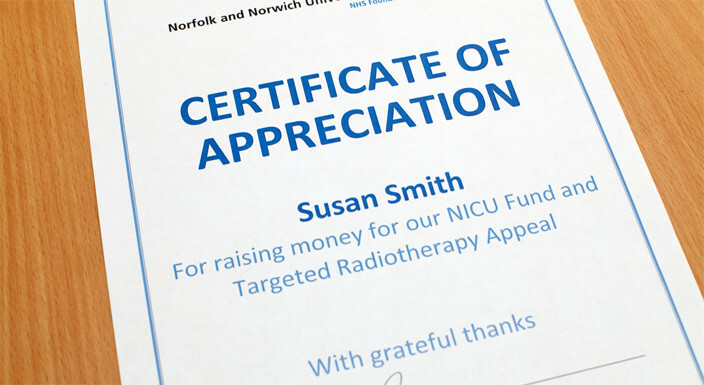 We have no doubt that our baby would not be alive if it were not for the amazing work of the NICU team at the Norfolk and Norwich Hospital. My wonderful sister Claire Brindley decided that she wanted to “do something.” It is difficult for relatives as they feel helpless to both the parents (who spend most of the time at the hospital) and the new baby. So on 4th May at 12:30pm Claire is going to do a parachute jump in Beccles. This date is special as this is Sebastian’s actual due date. Claire set up the Justgiving page (every penny will go to NICU as Claire’s husband James has paid for the jump) and we have been overwhelmed by the generosity of friends and family. So far she has raised over £2300. Claire and I met with the fundraising manager from the hospital as we wanted some input on how the money was spent. There is a “wish list” – things from £100 special snuggle blankets to a £25k giraffe incubator. Thank you for reading our story. If you can spare any money to this worthy cause that would be fantastic. To date Seb is doing well; he weighs 6lb 10oz and can roll from one side to the other and smiles at us – not bad considering he should not be here yet! Love and thanks from Sarah, Mike and Sebastian Kelf.